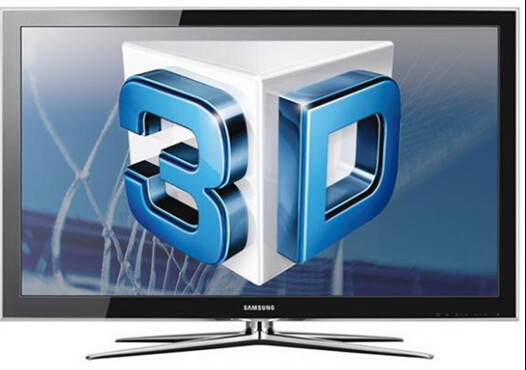 Generally, before you want to collect 3D movies to a hard drive for 3D TV, you should figure out what kind of 3D TV you have. Is it active or passive? That will make finding movies easier. This article gives a good overview of the different types. The result above will be in what you’re looking for and what file sizes you can expect. For example, if you have a LG 3D TV that uses side-by-side to display 3D, you should look for and download files with “HSBS” or “Half SBS” in the name. The result of this is a smaller overall file size, but effectively only 720p resolution. If you want 1080p, you need to look “Full SBS”, but the file will be loads bigger. If you want Blu-ray 3D, “FHD3D”, expect the files to be massive, they will take a long time to download etc. There are many sites which can offer 3D content, like YIFY and YouTube . I saw many people watching 3D YIFY and 3D YouTube movies on their 3D devices, like 3D TV, Gear VR. As far as I know, other major torrent sites, like forfree3d.com and KAT in particular also can be considered. But you should check the sample to make sure it is actually 3D, and not labelled incorrectly, as I’ve had that happen several times. Tip: The most common Side-by-Side 3D TV format is the Side-by-Side Half where each sub-frame occupies just half the horizontal resolution of a full HD frame, resulting in a 3D image with 960pixels by 1080 lines instead of the 1920×1080 required for full 1080p content. This simplifies the electronics while making it compatible with HDMI 1.3 devices. If you finally download a 3D movie to hard drive for 3D TV, but sadly find that the 3D type is not suitable for your 3D TV format, don’t worry. You needn’t feel upset if you have a third party video converter. A video converter is designed to convert any video to another format for your different video playback purposes on various devices. 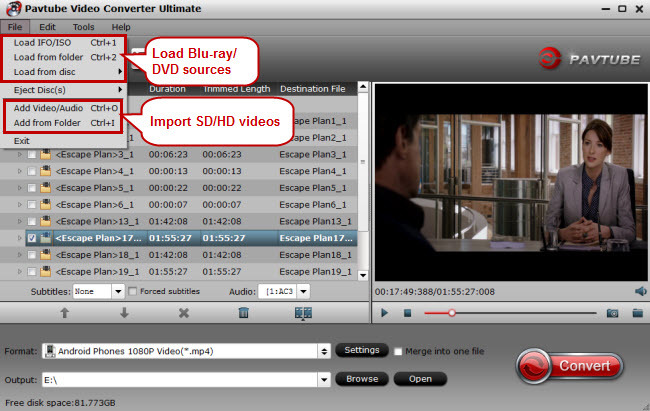 Pavtube Video Converter Ultimate is one of the top video converters recognized by consumers. It is easy-to-use and multifunctional. No matter it is Full SBS, Half SBS, OU or FHD3D, the software can accept them and transcode the one you want with the “Settings” function, where you can adjust the resolution of 3D content and the video frame rate, bitrate(determiner of video size), etc. Of course, as a professional video converter ultimate, it also can rip encrypted 3D Blu-ray and other 3D movies to 3D MP4/MOV/MKV/WMV/AVI and it even can make 3D out of 2D source. Note: The 3D effect is calculated instead of a true one. All video converters on the market don’t have the ability to create a 3D movies with the existing 2D source. How to Convert 3D movies to hard drive for 3D TV with 3D Video Converter? 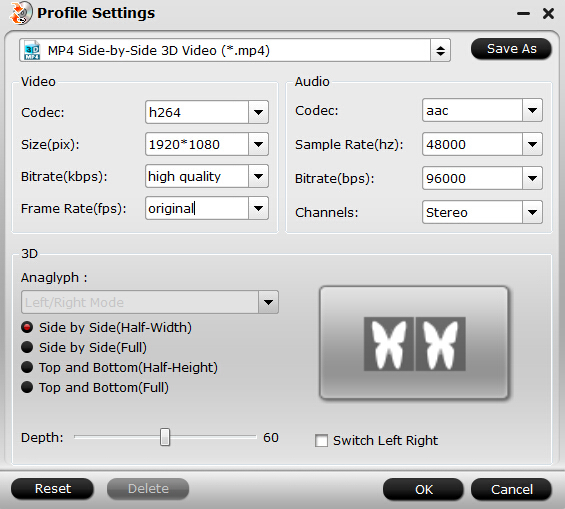 If you want to change your 3D MKV to 3D MP4, you can hit on “3D Videos”to choose the target format.Here, you can choose what 3D type to output. If you don’t want to re-determine the format, just ignore the step to turn to “Browse”to decide the output folder. Press on “Settings”. In the window, you can see “Size” choice, here, you can change the Full SBS to Half SBS by import 1920x1080p.Or you can choose the target in the below diagram. With the software, only you can download any 3D content from any sites without worrying the format issue. Of course, if you have 3D Blu-ray discs, you even don’t worry that you can’t find the the 3D movies to hard drive for 3D TV. Watch 3D Blu-ray with Google Daydream VR?